From left, Lane White, Logan Knez and Isaac Montoya hold up their trophy birds. The three were part of a mentored hunt program through Colorado Parks and Wildlife designed to further promote enjoyment of the state's natural splendor. On a cool, rainy Sunday morning in late September near the town of Craig, three young hunters began their day unlike any other day — sitting in a blind, enjoying their natural surroundings and gaining first-hand knowledge about hunting waterfowl from Colorado Parks and Wildlife officers. 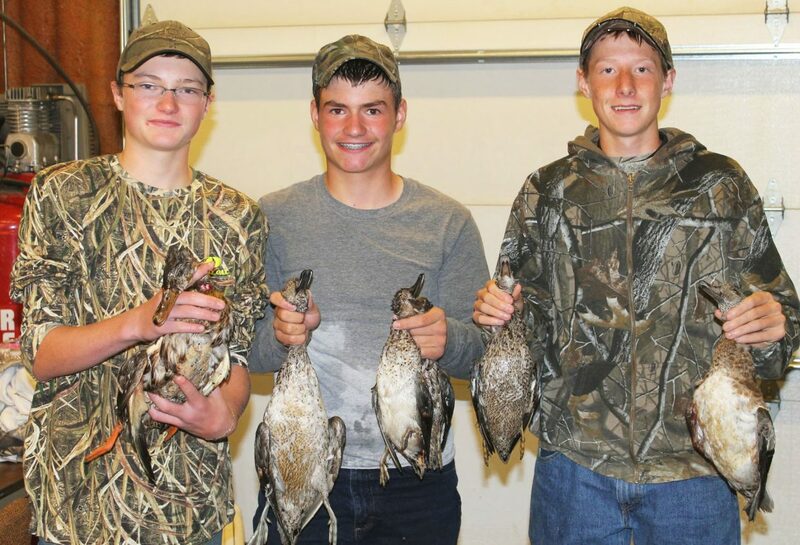 Moffat County’s Lane White, 14, Logan Knez, 13, and Isaac Montoya, 15 were selected to participate in the first mentored waterfowl hunt in this area and what will be an annual tradition for local youths. The mentored hunt is part of Colorado Parks and Wildlife’s Hunter Outreach Program, an ongoing effort to encourage women and youths to head outdoors and enjoy the state’s abundant natural resources. The participation of Parks and Wildlife technician Colton Murray and officers Terry Wygant and Mike Swaro was instrumental for the positive outcome of the mentored hunt. The officers provided guidance and knowledge, including a two-hour orientation covering firearms safety, rules and regulations, wildlife management and waterfowl identification. Jones added that the focus in Craig has typically been on the excellent big game hunting opportunities found in the area, but waterfowl hunting should not be overlooked. He noted how much fun each youth had during the hunt. White’s mother, Kindra, participated with her son. She said that the experience has given her the confidence to take him on future waterfowl hunts. “After everything I saw and learned, I now feel comfortable taking my son on a hunt like this,” she said. With the skills learned from their mentors, one pintail, one mallard, three blue-winged teal and one wigeon were harvested by the novice hunters. “Considering how much fun they had, I expect these kids will encourage their friends and family to give waterfowl hunting a try in the future,” Jones said.